Gov. 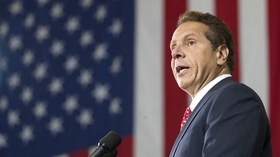 Andrew Cuomo has directed New York's top insurance regulator to reject the portion of health plans' proposed premium increases attributed to the requirement that individuals get health coverage or pay a penalty. Health insurers asked the state Department of Financial Services to approve an average 24% increase to their premiums in June, with 11.9% related to the end of the so-called individual mandate. The effect of Cuomo's action would be to reduce by half, on average, the amount by which insurers can raise their rates next year. "Insurance premiums must be based on actual cost and not political manipulation," Cuomo said at Mount Sinai Hospital in Manhattan, where lawmakers, health care officials and union members gathered for an event today. "We're not going to let Trump tear down our health care system." In December President Donald Trump signed the Republicans' $1.5 trillion tax bill into law. One of its provisions eliminated the penalties for not being insured. Cuomo said he would not let that action, one of several the Trump administration has deployed to dismantle the Affordable Care Act, result in a "bonanza" of hundreds of millions of dollars to insurance companies. The proposed rate increases would have led to a more than $1,500 increase in insurance costs annually for people buying coverage in the individual market, such as those who don't have coverage through their employer. DFS said last year that about 349,000 New Yorkers were enrolled in the individual market, including those who buy directly from plans, not through the state's marketplace. When DFS announced the health plans' proposed rate increases, it showed the percentage they were increasing rates that was attributable to the end of the individual mandate. Cuomo's decision will hit hardest for plans that based most of their price increases on the demise of the mandate. Fidelis Care, for instance, asked for a 38.6% average increase and said two-thirds of that increase were tied to the individual mandate. Insurers expect fewer younger, healthier people will buy health insurance when the penalty disappears. That will leave a group of less-healthy individuals buying coverage, which could increase insurers' medical spending and result in more price increases. The department makes decisions on rate increases for plans individually and could lower rates even further for some insurers. The elimination of the individual mandate justifies increases to premiums, Eric Linzer, president and CEO of the state Health Plan Association, said in a statement. He noted that the state Division of the Budget and the Department of Health had estimated that the end of the mandate would result in double-digit rate increases, and the Congressional Budget Office and actuaries at Oliver Wyman estimated its impact at 9% to 10%. "We agree with Gov. Cuomo that decisions on health insurance premiums should be based on math, not politics," Linzer said. "A key priority must be maintaining a stable marketplace in New York. Politicizing the 2019 rate requests will not help in this effort." Before the announcement, the event at Mount Sinai had the tone of a campaign event, with Greater New York Hospital Association President Kenneth Raske and 1199SEIU President George Gresham praising Cuomo's health care achievements while introducing the governor. "If you look around this country and compare other governors and look at what we have in a governor that stands up for working people, stands up for health care, that celebrates our diversity rather then uses it as a wedge to divide us, you realize we were given a blessing in New York and we need to keep that blessing going," Gresham said. Cuomo is running for a third term and faces a Democratic primary challenge from actress and activist Cynthia Nixon on Sept. 13. "Cuomo cuts insurers' request in jab at Trump" originally appeared in Crain's New York Business.